In the collective imagination, planets of a solar system all circle around their star, in the same plane that is also the equatorial plane of the star. The star also spins, and its spin axis is aligned with the spin axes of the planetary orbits, giving the impression of a well-ordered system. But nature is capricious, as an international team led by researchers from the University of Geneva (UNIGE), Switzerland, just found out: they detected a planetary system turned upside down. GJ 436 is a star that has already made much ink to flow, as it hosts a planet nicknamed the hairy planet that evaporates like a comet. In this study, researchers at UNIGE showed that in addition to its huge cloud of gas, the planet GJ 436b also has a very special orbit. It is "polar" - instead of turning in the equatorial plane of the star, the planet passes almost above the stellar poles. The orbital inclination of this planet as big as four times the Earth is the last piece of a puzzle that has baffled astronomers for 10 years: unlike the planets of the solar system whose orbits almost form perfect circles, that of GJ 436 forms a very flat or strongly eccentric ellipse, that is, its distance to the star varies along its orbit. 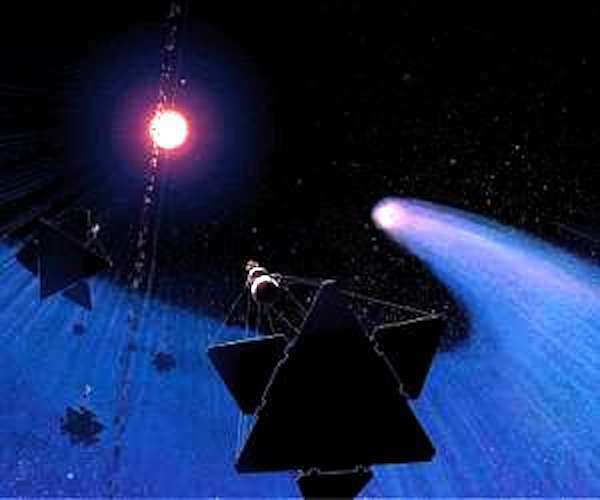 "This planet is under enormous tidal forces because it is incredibly close to its star, barely 3% of the Earth-Sun distance," explains Vincent Bourrier, researcher at the Department of Astronomy of the UNIGE Faculty of Science, first author of the study and a member of the European project FOUR ACES*. "The star is a red dwarf whose lifespan is very long; the tidal forces it induces should have since circularized the orbit of the planet, but this is not the case!" Orbital architectures of planetary systems are fossil records that tell us how they have formed and evolved. A planet disturbed by the passage of a nearby star or by the presence of other massive planets in the system will keep track of it in its orbit. "Even if we have already seen misaligned planetary orbits, we do not necessarily understand their origin, especially since here it is the first time we measure the architecture of a planetary system around a red dwarf," adds Christophe Lovis, a UNIGE researcher and co-author of the study. The existence of an unknown, more massive and more distant disturbing planet would explain why GJ 436b is not on a circular orbit: "If that is true, then our calculations indicate that not only would the planet not move along a circle around the star, as we've known for 10 years, but it should also be on a highly inclined orbit. That's exactly what we just measured!" says with enthusiasm Herve Beust, who did the orbital calculations.